You can’t afford to miss this entertaining and informative presentation based on cutting-edge scientific information. It is full of information showing how your gut micro-organisms can determine not only how healthy you are but are the foundations of your health and tell you how to think feel and act. In this presentation Dr Dingle will skilfully show you everything you need to know about healthy digestion, your gut microbiome and what you need to know it to improve your health. It can influence everything from cancer to cardiovascular disease and diabetes 1 and 2, depression to dementia, acne and psoriasis, eczema and it is the major cause of arthritis. 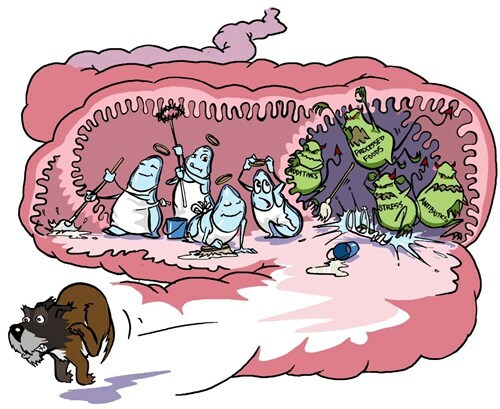 All diseases are influenced by the gut. Dr Peter and Martine Dingle have just completed their two books on the gut microbiome and health. With over 1000 scientific references, nobody knows this topic better than they do. "Wow what an enjoyable night listening to a Professor, Dr Peter Dingle explain why it's sooo important to look after and balance your gut. After all the times I have seen and listened to his very wise words, this was the best information. As the saying goes knowledge is no burden to carry”. - Cheryl Geraghty. Gosford. Nsw. “I was at your talk last night in Gosford and wanted to tell you how great it was. I got so much from it and haven't been able to stop telling people about it today!! My husband came home (he was one of the three guys in the audience) and started rummaging around for the bicarb and green tea :)”. - Dr Rachel Swan. Gosford. Nsw. - Leanne Rose. Grafton. NSW. "Your presentation last Wednesday in Loganholme was splendid. Normally I fall asleep after 25 minutes. But your presentation kept me on the edge of my chair for 105 minutes." “Absolutely amazing. Best gut health talk I have been to by far. Extremely informative, motivational and inspiring. Highly recommend to everybody. I will be back”. “Thank you so very much. I have been very keen and excited to learn more and now I go away with many tools to help my family and kids to stay gut happy and healthy. I will be dragging my hubby next time”. “Exciting, stimulating and very well presented. Very clear and simply explained”. - Laurie Romsdan. Gosford. Nsw. “Excellent- everyone needs to hear this”. - Rachel Swan. Gosford. Nsw. - Tania Turner. Gosford. Nsw. “Fantastic. Would recommend to everyone and anyone”. - Sharleyne Russell. Gosford. Nsw. “Sensational!!! Very informative, loved every minute, very educational and entertaining as well”. - Norma Kaloudis. Wollongong. Nsw. “Simply life changing, I urge everyone young and old to attend Dr Dingle’s presentation”. “I learned so much, much more than what I thought I would about my gut health and ways to improve it. Absolutely best night”. “My family and I attended the Canberra seminar. It has opened our minds to a better way. Strongly recommend you attend a seminar near you, you will walk out changed for the better”. - Darleen Barton. Canberra. Act.